During the 1990s, few teas cakes were made entirely from old growth arbor tea trees as compared to the practice today. This tea cake was made entirely from centuries old tea trees in Jingmai Mountain and then aged in Yunnan since production in 1998. This cake was repackaged and made its debut in China recently and has been much revered. The wonder of this tea begins when you brew it because the aroma of the tea can be detected from afar. The first sip gives you a strong ginseng fragrance, a distinctive bitterness turned bitter sweet. The subsequent brews reveal a combination of stone fruit and sweet Longan (Dragon eye fruit) flavors. This tea is very pure, yet the flavors are so complex. The "Qi" is quite remarkable and relaxing. Drink this tea in the evening, take a deep breath and you cannot help but feel that "life is good." NOTE: free shipping on sample. 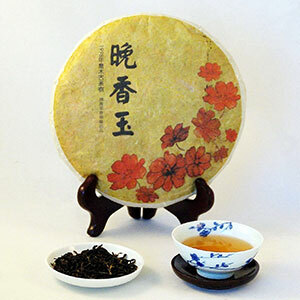 This aged Pu-erh is best brewed in a small 100cc-150cc Yixing teapot. Use boiling water to make the first two brews. Use slightly cooler water (208F/98C) for subsequent brews. - Pour hot water inside and outside to rinse and warm the teapot. - Fill 1/3 of the teapot with tea leaves pried from the tea cake. - Pour in boiling water (212F/100C) to quickly rinse the leaves. - Discard the water immediately. It's an amazing tea. The flavors keep changing in my mouth.